The starter kits contains everything you need to start cleaning. 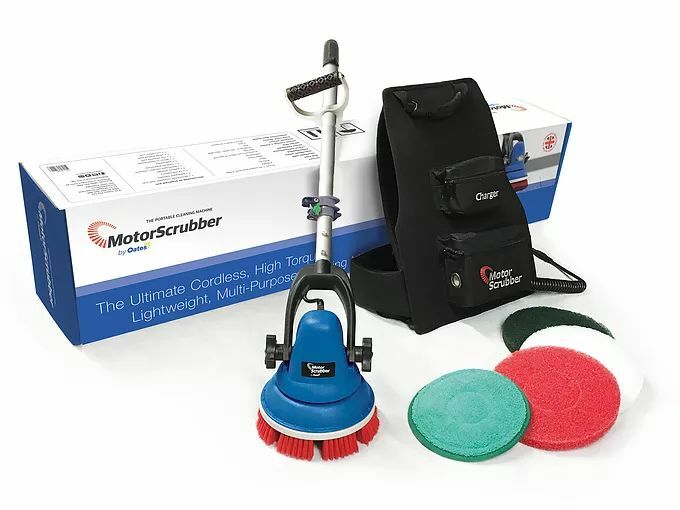 MotorScrubber is a battery operated 8inch scrubbing machine designed for cleaning all those areas where the larger machines can't reach. The different applications MotorScrubber can be used for are endless. The high torque motor made by Mabuchi Japan can't be stopped giving super powerful scrubbing performance, the high strength gear system made by Hitachi ensures reliable running for years and years. The most popular uses for MotorScrubber are stripping floor polish, especially around edges, stair cleaning, washroom / toilet, floors and walls within hospitals, food prep. areas and factories and vehicle cleaning and stainless steel buffing.